Been a long time I did not make a post because too lazy to make new posts, but already there are some tips or turorial is to be made. This time is not much different from the last post, namely how to install android on a PC or laptop with android x86 kitkat. Already three posts related to how to install android on a PC or laptop that can be installed directly to the partition or to the emulator by using virtualbox, and can be used or a dual boot with windows xp, windows 7 and windows 8 even with linux like ubuntu etc..
Android kitkat is the latest android version with some significant changes, the display is a bit similar to the jellybean but new features from this kitkat android maybe you can see and feel after you install. This kitkat Android emulator version that can be installed directly on a PC and can dual boot and can also be installed in virtualbox, but the functions and features nothing has changed with the android version kitkat on Handheld. But the differences features are usually can be see from display a Custom ROM you used. Are you the one that's already tried this android kitkat, if it not possible to try and follow these steps below, or you have own steps to install this android x86 kitkat on your PC/Laptop. A. Install android 4.4 x86 kitkat using grub from android itself but this is not recommended, because if something goes wrong like boot windows erased or overwritten by grub boot boot into windows will result in an error. In this step A your MBR disk setting will be replace with grub from android so i suggest to think before use this step A, see in step B below. 1 . Create a new partition in the windows 2GB , and format it to FAT32 type partitions can be put together at the windows but it is good in separation because if there is an error then the windows will not be disturbed . For more details can be seen in the video below this post . 3 . - Burn into the USB flashDisk with Unetbootin , but be careful when going to burn it to flashdisk the datacan be erased . - Burn to cd use nero or other iso tools . 4 . Restart the PC and then boot to USB flashdisk or cd android 4.4 kitkat by way of plug usb stick into the PC and restart the PC and then enter to bios and change the first boot to USB or CD if that use CD or if you know can directly click the button boot like F9 , F10 , F11 or F12 in accordance with the settings of the PC bios . In the picture above because I made a partition on the hard drive is FAT32 only one there for android so mean here the partition for android is / dev/sda3, so later on when install android install to sda3. 6. Restart the PC and boot back into android and select the fourth ie Installation - Install Android-x86 to harddisk. 8. In other next option do not format the partition to another type and chooce OK and enter. 9. Install grub select yes and enter. 10. Select yes to boot to windows through grub. 11. Once we enter the android will soon be installed, and then to determine the memory capacity for android, we can give a maximum of 2048. 12. 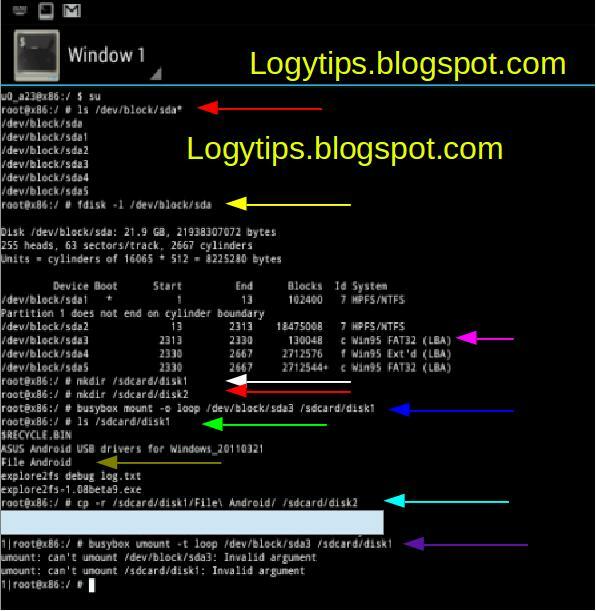 After install is complete, restart the PC and unplug the flash drive or cd in cpu, and the image below is an example for a grub boot android and windows. 1. Follow the above steps of No. 1 to step no.8, then for grub option do not install just skip for grub install. 2. Then if there is an option as shown below select OK and enter. 3. Then Select Yes to save the data.img on hard drive, the maximum memory size is 2GB or 2048 MB. 4. When finished reboot or restart the computer and run into the windows. 5. Grub2 for windows download here. Extract grub2 for windows on drive C:/grub2. 6. Go to the folder and install grub2 in grub2 folder namely is grub2win.exe after installed grub.cfg will there, open grub.cfg with notepad and add the android boot menu at the bottom of the texts. below is boot android text. Replace the red text with a partition installed android for example the android installed in sda3 then replace hd0,X above with hd0,3 save a notepad and restart the PC or computer and after turn on the computer there will be two options first boot windows and the second is gRUB 2 Windows option and select the grub 2 android windows to get into android. Install android x86 Kitkat dual boot with windows 7 video. If there is a mistake in this article or have any questions please comment in the comment box below this post. Is there a way to run Android X86 and Windows 8 on the same HDD and create dual boot? I have followed your instructions but Android won't install as it says this when I try to choose what partition i want "unsupported gpt (guid partition table) detected. use gnu parted "
Yes it is.. you can use dual boot windows 8 and android in the same HDD with different partition but your hdd have to MBR. Yes you can 1st download and install a program called Minitool Partition Wizard into Windows you'll need this to create the partiton and to format it to Ext3 this is so you can use the newly formed partition as storage for Android. Once this is done reboot into Android installer and choose to install to HDD on the next screen the installer will ask you which HDD/Partition to install too. The partition you've created will be easier identified as it will be the only 1 marked Ext3. When it's finished booting up you should be greeted with the new boot menu asking which O.S you want to boot. You need to format the partition to Ext3 otherwise the installer will only give you the option of 2048 memory and there's no easy way of extending it once Android is installed. If your done the Install right the Ext3 partiton that you've done ie.32gb will be the amount of storage available for Android. Hope this helps. GOOD LUCK! kenapa yah gk bisa install bbm?? Thank you Zein but the code i had pasted above was working for me. Also I would like to have both the Android Kitkat and the Android Kitkat(Debug mode) options in a folder named Android in grub2. Is this possible? can you give me the necessary modifications for this? Thank you anyway for your instructions. I meant that both the boot options for android kitkat in one folder. Is that possible? Also can you tell me how can i access my other partitions inside x86 Kitkat. The drives show up as USB drives but they are shown as empty. I want to listen to music, watch movies and otherwise do my work with files which are in the other partitions inside this android x86 OS. Please help me! Can I just keep all my partitions mounted? If I reboot and go into Windows I can still access them right?. Also since the entire size of my android partition is 5GB, I cannot copy too many files at a time..
Thanx man , every thing works , even the grub2win works ! , i was thinking , after dualBooting win 7 and android , is there a way i can increase the data.img , which i made only 512mb ? Dose i need to increase the partion from 2gb to 3 or 4gb , to make the data.img of 2gb ? And one more thing , dose the partition format need to be ext3 or something to use super user ? 1. You can increase data.img maximal 2gb cause if you increase your data.img more than 2gb android will not recognize sdcard. Hi. You helped me last year to install android x86-4.0. It worked very well. I saw the kitkat and thought it would be great to have it. I deleted the 4.0 and installed the kitkat, also I deleted grub2win and installed it again. I changed the red text with the drive where my android is. Problem now is that android gets stuck when it is supposed to show the big android screen. then it reboots. This is how my grub cfg looks like. # the $winpart variable provided by Grub2Win. # is not necessarily the Windows C: drive. # Windows sometimes boots from a special "System Reserved" partition. # This depends on how Windows was initially installed. Hi zein. I am still struggling with kit kat. It's not booting at all. One thing I realised is that I cannot boot android. From the memory stick. I can boot the same usb on another computer. Am I missing something? Please help. Thank you. can i use ethernet ? Is there anybody who can help me out with kitkat. Tried a million times but nothing. I must be missing something and I cannot get it. This is where it gets stuck early console in decompress_kernel Decompressing Linux... Parsing ELF... done. Booting the kernel....... found at /dev/sda1 ANDROID root@x86, from here it reboots and does the same thing over and over. Tried with other versions and the same thing happens. Please help. I decided to revert to the 4.0 and it works great. Maybe Kitkat is not for me. Thanks a lot for the great posts. Hi Sir, i'm having this error as of the moment: x86:/ #... I have a HP laptop cq42. would this work? because i've tried yet still it does not work.Does it work with intel processors? 1. Follow the above steps of No. 1 to step no.8, then for grub option do not install just skip for grub install." or should I format my android partition/repair my MBR, and re-install kitkat without installing the "boot loader grub" (Part B section 1 of your explanations) ??? Unfortunatelly, it did change nothing. I still have a 5 choices boot (4x Android and 1x Windows). And both OSs are still running great. I'll give a try to format my KitKat partition, then repair my MBR with my Windows Dvd, hoping I will still have Windows 7 running smoothly. And onky then re-install KitKat untill I will arrive to "then for grub option do not install just skip for grub install." i have another Samsung XE700t tablet, it’s for my friend, I installed the 4.4 iso android on it, And its working very well, so I’m wondering why it’s working on many laptop & tablet except my Acer Iconia W700 it didn’t???? i said the Android 4.2.2.img works very well, the problem is with android 4.4 the latest one, it dosnt work!! 1. What grub you use ? 2. did you change the grub setting for android 4.4 manually? 3. or you use curent grub setting by android grub installed? ( android-4.4.2_r1-ia2 Released: 28 Apr, 2014 ) ????? Zein hello and thanks for posting. After step 7, it tells me sda2 (which is what it showed up as mine is) cannot be mounted and i have to format it. Any ideas? is your HDD is Dynamic ? saya mau nanya nih, kok android saya gk bisa di jalankan gan..
setiap kali boot di grub2 munculnya tulisan ANDROID root@x86:/ # padahal saya sudah seting grub nya seperti di atas, tapi tetep gk muncul" desktop ny. Emang pertamanya ada tulisan seperti itu dan jika android ditemukana maka akan ada tulisan android found in /dev/sdX..
kemungkinan ada yg salah dari partisi nya.. partisi beda sama yg diatas kali gan..
Obviously you will need to change/edit the set root='(hd0,7)' line to point to the correct partition for Android x86. Hope this helps others. how to change boot.ini in winxp to start android ? I had a problem with grub2win, it doesn't support windows 8.1. It has an alternative? where you download the grub2win ? dear zein....i'm using lenovo g510...i burned x86 on to flash drive...thats ok...and without installing i'm able to open android....but...after watching this video created a seperate space as you mentioned above...after restart when i'm booting in to android through debug 3rd one as you mentioned....and typed my drive fdisk-1 its not recognizing...i'm not able to install...plz do favour...its complicated bios options in lenovo g510...once go through and help me out....thanx in anticipation....reply...plz.. I have tried reinstalling with both FAT32 and NTFS format. Same result. Thank you so much for the helpful information. Thank you for the response. I have checked several times, and I have the correct partition specified (hd0.4). I think perhaps something is wrong with Grub2Win, because i tried installing 4.4 RC1 and it did the same thing. I have tried every option I can think of with no success. I am tring to add Android-x86 to an existing dual-boot (Windows 7 and Windows 8.1) system. Created Fat32 partition, installed Android-x86-4.4-RC2. After installation Android ran just fine. But when I try to reboot using Grub2 (and the configuration recommended above) I get to the grub2 menu, select Android, and then I see "Decompressing kernel" and then "Identifying android-x86 ....." which just hangs there, adding a dot every couple of seconds. "Identifying android-x86 ....." which just hangs there, adding a dot every couple of seconds. Zein, your English is excellent. I have checked the partition number several times. My hd0 has four partitions; the windows recovery partition, Windows 7, windows 8.1, and then Android-x86. I have set root= hd0,4. During installation this showed up as the right partition (#4). The syntax I am using is set root='( hd0,4)' correct? I have tried hd0,3 and hd0,5 which don't work. If I try other partition numbers, such as hd0,2, I get the error 'android-4.4-RC2/kernel not found' . So It is obviously finding the kernel correctly at hd0,4, but something is going wrong after that. You type with wrong command.. If I have a dual boot system(Win7 + Win8.1) do I have to install grub2win on both systems before installing Android-x86 in the next partition? You can try that app . I was the same problem with mike s.
1. Install applications ext2fsd to windows 8. 3. Moved out all of the data contained in the folder "android-4.4-rc1"
Adenan, your English is great. Thank you for solving the problem! Did u using win2grub ? Please help, I did as posted above but i get this message every time i try to load up kitkat. Error: can't find command 'linux'. Okay i got it hehehe sorry new problem is ther away to expand the internal memory past 1.24 gigs? if so can you tell me please? sorry delay to respond .. what the problem now? Hello friend I would like to install android 4.4 rc2 dual boot windows! more like i have 2 hd's different being that HD1 = 500gb Windows 8.1 and the other is 320GB and would like to install android without losing any data from HD1! thank you for your attention! What did you use partition to install kitkat ? 1. If you install on NTFS partition your android kitkat will not rooted. In the first menu page of android installation chooce the third choice Live CD - Debug Mode and the typy fdisk -l command see at step no 5 above. There are two method in step above ,, one grub from android and grub from windows so what method did you take in step above .? maybe your grub setting is wrong.. where your android installed partition and name folder of android in grub must be right. Then i changed the Android data\time option. I added 1 hour each time, then cashed-out MyCountry game. I did that about 10 times , then I shut off netbook for night time. The 4.4 kitkat rc1 was working flawless prior to "My Country" game clock hacking. Any advice ? I thank you more than the Earth population. you only change data/time ? i think the problem not from data/time ..
Did i ruin inode by changing date\time ? Can I reset Android or do inode fix without losing the "MyCountry" game data? I don't know much about inodes. So I am total noob. Thank you. no you didn't , i think the problem is from android system. can you found reset button or Factory data reset in setting backup & reset .? Bakcup your data game in android folder --> data or obb to usb flashdisk and reinstall android . Yes, only the time was changed. I think Updates during the time-edit is Journal problem. Then I went back to win7 and copy the 'data\data\mycountry' contents into the 'android\data\data\mycountry'. Then I load the game with perfection. Now I use the SBGameHacker app. So I not need to worry about time edit. I tested the time-edit after the updates and before the updates. Everything is working good. I think the problem was with an update to google keyboard. Thank you ! See you again. The only "Easy" app I find to work is SBGameHacker version 2.5.2 . I tried many appz and other versions of SB..
Good Luck ! ty, Take care. Hii man greats video by the way i just have a question plz ,when i plug my usb it say that somting is connected but i can't find my usb in android cuz i wanna transfer files from windows 8 to android ,(sorry for my english lol) plz helpp ! Hi, I bought Pipo X7s that have dual boot, I can boot and choose between Android 4.4 and Windows 8, however after I have updated the windows, I lost the boot menu, is there a way to have it back? I am the android partition is still there, the when I restart, the box goes immediately to windows8.